No need extra Apps or phone cables. Just plug in the adapter to your HDMI-Enabled devices and USB adapter or interface, Search and connect the WiFi, Mirror the media from your phone/tablet. Share photos with your friends without having to crowd around a small display, stream music through your HDTV speakers for better sound, or watch movies and TV shows already downloaded and saved to your device. DIWUER MiraScreen Video Adapter Support DLNA, Airplay Mirroring, Miracast, Smart View and other WLNA display(Just click the mode switch hole). 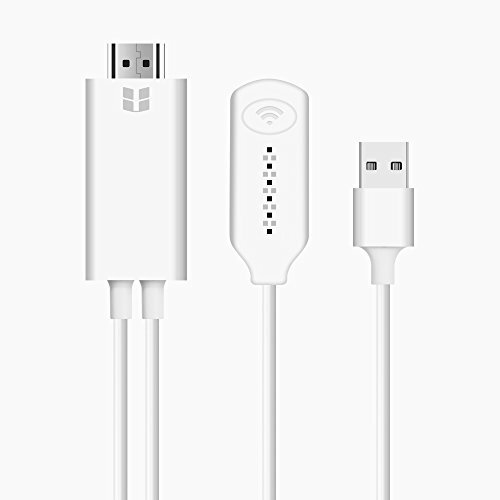 --No App download needed, no need connect to your phone by USB cables. There is a mode switch key on the adapter, you can switch between iOS and Android easily. --Make sure our cable can support the apps you want to mirror! Due to the copyright protection (HDCP), public sharing of the contents on the screen may be prohibited by some video service providers (such as Netflix, Amazon video, HULU). --Make sure the power you supply are 5V/1A or above,otherwise it will not work. Only support 2.4GHz WiFi hotspot, not support 5.0GHz WiFi hotspot. --Please check your TV/ Monitor/ Projector whether with HDMI port on first before you purchase this item. CORDLESS DISPLAY : Stream 1080p videos, games, audio, pictures, Apps and files from your iPhone/ Android Phone to your HDTV or Projector. Support HDMI 1.4A 1080P 60Hz full HD output provides the perfect experience. GOOD COMPATIBILITY : Smartphones and tablets (Samsung, Sony, iPhone, etc) with Android 4.4+ and iOS 10.0+ (work with iOS 11) / Windows Laptops are supported. The software can be updated online and still works when your smartphone or tablet is updated. COMPACT & EASY to CARRY: Tiny Size, The wireless stick is perfect for presentation in the office or at school (Powerpoint, Excel, Word, PDF and pictures from the smartphones, tablets to the HD TV or Projector). It's also a good choice to mirror Smartphones/Tablets gaming to HDTV. If you have any questions about this product by Enfonie, contact us by completing and submitting the form below. If you are looking for a specif part number, please include it with your message.